개요: God says...everyone must stand before God to be judged. God does not want man to go to "the fire" and has made a way for us to come back to Him and have our sins forgiven. Explanation of Christ's atonement, death and resurrection. Man can accept or reject. Only one way. Ask Jesus to save you. Sinner's prayer. Invitation. Illustration involving canoe and mountain. God says in His Book that all men must die once, but after that God's court. We all know we must die, but not everyone knows that they must appear before God's court after death. Some people think that after they die they go to a sacred island or mountain. But they are not certain; they only think this way. God Who has created man tells us true. He says all people have sinned and broken His law. When they die, it is true their bodies will rot in the grave, but they are not finished. Later they must stand before God's court. Their sins will be brought before them and they shall be sent to everlasting fire to be punished for their sins. But God does not want people to go to this fire place. God hates sin, but loves the sinner man. So God made a way back for the sinner to come to Him; so that He could rub out His sins. He sent His only Son to this world. He was born of a virgin mother and took on our likeness, so He could die for us and take our punishment. He was true God and true man too. Jesus went willingly, letting wicked men take Him and nail Him to the cross. Just before Jesus died on the cross, He cried out, "It is finished." This means He took every bit of our punishment from God for our sins. After three days God raised Jesus from the dead. Later Jesus returned to heaven. Jesus is busy now making ready a good place in heaven for people who turn from sin and trust Him to save them. But if a man does not want Jesus, he must perish, and take his own punishment. Suppose a big flood came down the .. . . . River, and one man fell into it, and the river carried him out to sea. Later a boat (canoe) came close to him. Now there are two things this man can do. He can look at the boat and do nothing, or he can cry out for help; then the boat will come to him, and he can get inside and be saved. Now Jesus is like this boat (canoe). Plenty of people are ready to die, but they just look at Jesus. But just looking can't save them. They must call out to Jesus, "Jesus, come and save me. I am in trouble. I am a sinner." Jesus will hear this cry if it be weak or strong, and save this soul from death (perishing). 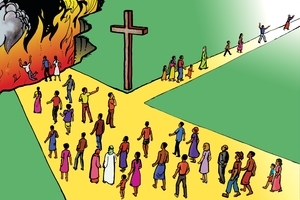 God says there is only one way for you and me to be saved. We are too weak to save ourselves. We must ask Jesus to be our Saviour. Then God will rub out all our sins, give us a clean heart, and give us His life which will never finish. GRN has recorded a version of this script in 86 languages and dialects. See full list.